The school year is actually based on an Agrarian Calendar. Traditionally, students take a break from school to help out in farms during the summer months. While this is no longer applicable today, we still continue to have a break during the season. And as a result there is a tendency for children to be idle at home. It is important for kids to have a sense of routine and structure for them to have a better sense of security. Most students respond positively to structure which maximizes learning opportunities and minimize distractions. This is also the reason why teachers advise new students to take summer classes. So, they can adjust well to their new environment and be familiar with the routine. Attending school during the summer will surely prevent what teachers call the Summer Brain Drain. When students come back in June, most of it is spent reviewing lessons that have been lost or forgotten. Instead of learning new material; time and resources have to be dedicated for catching up. Summer school/ camp/ classes are an ideal venue for making new friends or keeping in touch with old ones. 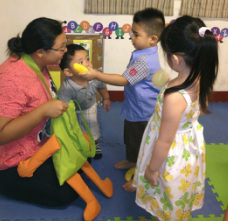 In the Childstart preschool setting, teachers foster an appropriate social environment by modeling and teaching children respectful interactions with others, encouraging them to play and work harmoniously, and how to resolve conflicts among themselves. Learning something new -- be it a sport, craft, song or a recipe -- is always fun and exciting for children. 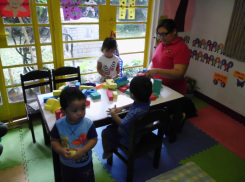 We, at Childstart, capitalize on play learning, so lessons become more meaningful for children. This year's summer camp is divided into four themes in which academics are integrated. Talent Enrichment Classes - If your child has a knack for singing and dancing, go ahead and enroll him/her to Music or Dance Classes. Remember to gauge your child's reaction by trying them out first. Sports / Martial Arts Activity - Having a physical activity is the best way to stay fit and get rid of excess energy, thereby allowing the child to be more focused. Sports and martial arts also instill discipline. Tutorial - Did you miss plenty of school days and need to catch up? Having a one-on-one tutorial may be the best option for you. Make a Family Trip Educational - Keep your eye open for learning opportunities. If going to the beach, name sea animals or review counting by picking up sea shells. and how to use tong as a tool. dexterity and strength of our little hands! Ah, the toddler class*. In all my years of teaching, this is the most challenging! Believe it or not, many teachers dread this level. And rightly so! Toddlers can make a faint hearted novice teacher run for cover and cry in a corner. Don't be fooled by their cute and cuddly exterior -- they can be tricky and very strong-willed. But they will hug you and love you unconditionally. One look in those sparkling eyes and they've won. 1. Create a safe and secure environment. Cover all outlets. Keep wires out of reach. Baby-proof. These are obvious. But more importantly, a toddler needs to feel at home in the classroom. The room should be cozy with just enough space for playing and doing activities. It should also be properly decorated, playful and inviting. I love framing old artworks of children and painting window glasses with poster paint. Kids also feel at home when they see their works posted all over. This gives them a sense of ownership. 2. Exercise! Include lunging and squats. It is also a must to be face to face with children when talking to them. How would you feel if you looked up all the time? 3. Prepare lots of creative activities. Researching new arts and crafts techniques is a good way for me to spend my free time. Toddlers have a short attention span than older children. So, I must always have something prepared for them to busy themselves. I also enjoy experimenting, like trying out different media for painting. Using small toy cars dipped in paint, to learn the color blue, was a big hit among the toddlers last Summer Camp! They actually stayed in their seat for this one. 4. Practice talking in front of a mirror. 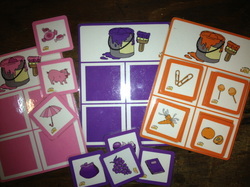 Vocabulary building plays a major role in development. This can be achieved through story telling and of course talking. It's an advantage that I am chatty and not easily embarrassed when ignored by a child. Yes, toddlers (and sometimes older kids too) will often ignore you while their engaged in something. But it doesn't mean they can't hear you. 5. Always remember to look at things from their perspective. Parents often say that their 2 year old does not know how to share, especially with new friends. While it is important that we encourage them to play nicely by sharing, we also have to understand their point of view. Let's put it this way: Say you bought a new car, are you going to give or share this new car with a person you barely know? When your tot doesn't share, it doesn't mean he's being selfish. He is just acting his age. What to do then? TEACH BY EXAMPLE. For instance, when sharing a meal, give him some of your food and use the word "share" to describe your action. During group play, I like putting out a new toy and let them take turns with it. "Don't cry over spilled milk," literally and figuratively. It is best to always stay positive and keep smiling! I am really optimistic for this school year. I can't wait to see my little ones this June! Just recently, Dr. Seuss turned one-hundred-and-nine, and the kids and I had to celebrate! We had a Dr. Seuss day and explored books like 'The Cat and the Hat', 'Green Eggs and Ham', and 'There's A Wocket in My Pocket'. We used them to study rhyming words to help the children review spelling. 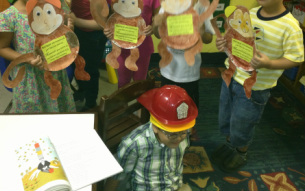 They were thrilled since the stories are easy and such fun to read. Why choose Dr. Seuss? His books can improve Phonemic Awareness. This is defined as the ability to identify and manipulate different sounds. It is a general understanding of how sounds are put together to form words. It is important for early readers to be able to relate sounds or phonemes to their written form. The word 'cat' for instance can be broken down into three -- /c/, /a/, /t/. When young learners already understand this, they are able to read and spell better. Word recognition is “the foundational process of reading and is needed to support vocabulary attainment and reading comprehension” (Archer, et. al, 2003). Even if a child knows what a 'closet' is for instance, if he is unable to read it properly, he wouldn't understand it. When children are able to decode words better, they become more fluent in reading. 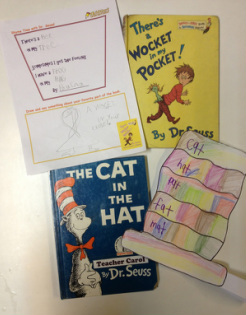 Help your child improve reading by sharing a Dr. Seuss book at home. Play around with words and make your own rhymes. Change-up Game - Start with one word, for instance "tall" and let your child change the beginning letter (wall, ball, hall, etc). Go ahead and play with the middle sound too. Rhyme Tic Tac Toe - Instead of x's put in words that end with -et, for example, and for o's put in words that end with -ed. Whoever gets three rhymes in a row wins. 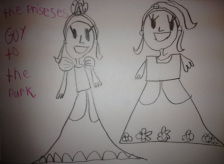 Guess a Drawing - Draw the exact picture you want your child to guess but what it sounds like. Straight lines, curved lines, spirals, copying letters -- when we think of writing instruction, this is the aspect that usually comes into mind. Yet writing is so much more than that! To write is to express oneself in print. It is important for young children to understand that writing is a way of sharing one's ideas and knowledge. 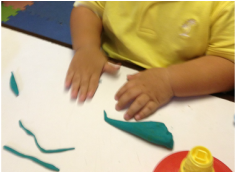 In preschool, children are exposed to various fine motor exercises to be able to develop finger dexterity and grip a pen firmly with a steady hand. Then they are taught trace lines, shapes, the alphabet, their name and eventually copy words and phrases etc. Later on when they advance to the preparatory level or early grades, they write sentences and phrases. This is the typical progress. However, by the time children are supposedly old enough to write sentences, they have difficulty in composing and actually write something. They lack writing fluency. Parents and teachers do not have to wait for the child to master the correct strokes of the letters and spelling before encouraging them to be little authors. Writing helps children develop phonemic awareness (letter sounds). And being exposed to books, stories and texts aids children to write about something. 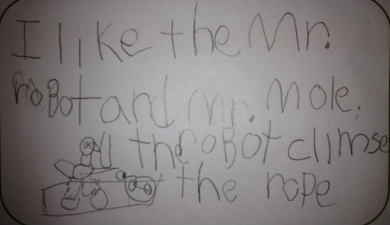 From a story a child read, he wrote "I like the Mr. Robot and Mr. Mole. The robot climbs the rope." Children exposed to a print-rich environment, stories and shared reading are encouraged to write about their favorite events or characters. 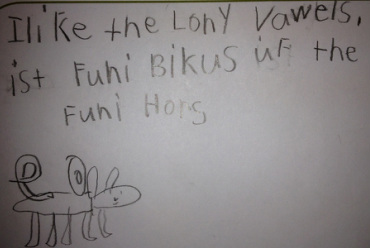 A 5 year old girl writes, "I like the lonely vowels (video). It's funny because of the funny horse." Don't worry if the spelling is incorrect or used what educators call invented spelling. Why should teachers and parents encourage developing readers and writers to use invented spelling? 1. Invented spelling may strengthen children's understanding of sound-symbol relationships. Adams (1991) suggests that the use of invented spelling may encourage children to develop a strong sense of the relationship between spoken and written words. When they are encouraged to "spell words they way the sound," children may develop an independent, intrinsic interest in the text in their environment. 2. Invented spelling may foster writing fluency.In a study comparing children who were taught using traditional spelling instruction and children who were encouraged to use invented spelling, Clarke (1989) found that children who used invented spellings wrote longer stories and demonstrated higher skill at word recognition. 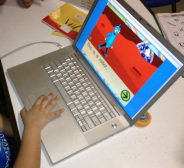 It is possible that the children focused more on their ideas, which compelled them to write freely and creatively. Drama lessons form a rich vein of imaginary experiences from which to write. Having imagined a sequence of action by taking part in it, children have more imagery to call upon in terms of plot and content when they come to write (excerpt from my thesis, Creative Dramatics: Facilitating Kindergarten Children’s Emergent Writing Skills). The oral language skills developed through dramatics have been found by some scholars to facilitate student’s writing skills (Heathcote, 1981; Wagner, 1985). This should not come as a surprise. When we think of writing, we assume it's text like this. Yet years ago, people used to write with images (e.g. cavemen drawings and heiroglyphics). The early sign of writing too is in images --- in scribbles. To young kids, a squiggly line is more than just a squiggly line! They often tell stories. 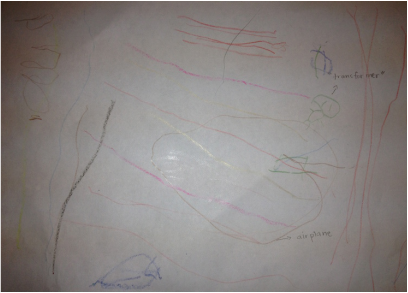 A boy aged 2.5 wrote about how a transformer robot rode an airplane to fight the bad guys. A joke goes, "there are 10 kinds of people in the world, those who understand binary and those who don't". I am with the latter. Math has always been an intimidating subject for me, so each school day I try and make the effort for my students to love it! I do hope that they grow up understanding theorems and polynomials better than I did. In a related article on Math Anxiety (fear in math), one legitimate cause of it is that building blocks are missing. Without the basic foundations, a child's background on the subject is weak and therefore that child will experience difficulty in advancing to more complicated lessons. Other reasons for Math Anxiety are Math is thought of as boring, takes too much time and is just too complicated. 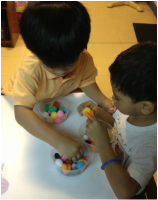 As a teacher for young children, it is important to promote math as an enjoyable subject and integrate it in play. Just recently, the kinder kids were introduced to currency. 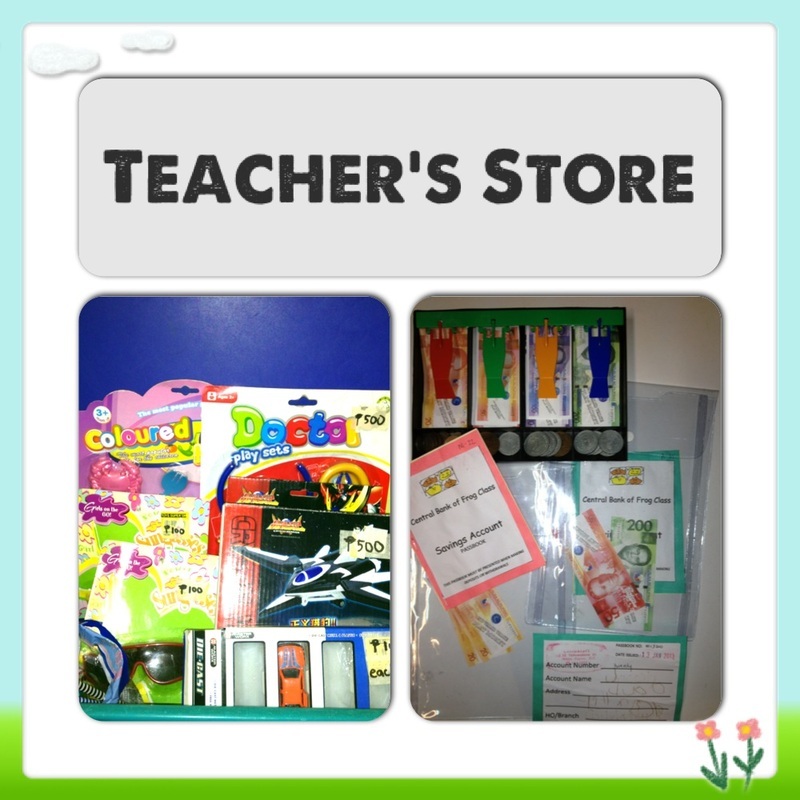 To help them understand (and appreciate) the value of money, I opened the Teacher's Store. 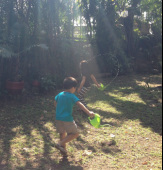 When the children finish their task or "job" for the day, they earn P20 in play money. Their "salary" is fixed and may be spent in the store. 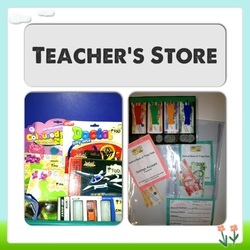 The store is stocked with small items ranging from P5-25 and bigger, nicer toys priced at P100 and P500. It is up to the kids whether they want to spend or save. It amazes me how much restraint they have just to save for an item they have their eye on. They also look forward to pretending to make withdrawals from the bank before shopping! Math is generally abstract, and we as adults tend to over-think how to promote mathematical thinking in children. But really, mathematical concepts are disguised in simple hands-on activities. 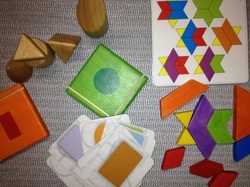 Here are some math activities we, Childstart teachers, integrate in our classroom. We use materials that is interesting for youngsters, like small cars and fruits, for assigning quantities. 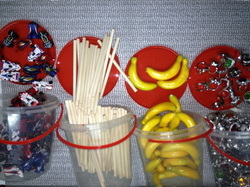 You may use other more common items, such as pebbles, popsicle sticks, rubber bands, crayons, etc. Sorting promotes children's ability to organize. And we just about sort everything in school -- by color, size, shape, texture, etc. Clean up time is basically sorting time. Teacher Cat sorting blocks with toddlers. Patterns are everywhere and it doesn't take long before young kids are able to discern them from their environment! 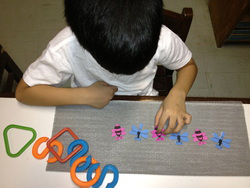 We use chains, beads and strings, and other items to improve patterning skills. As the children play with blocks/ 3D shapes, tangrams, and other manipulatives they start fitting them together to create buildings, houses, cars and other objects that make sense to them. 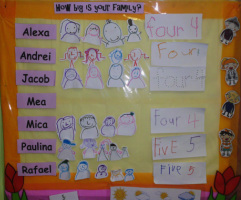 Various math concepts are integrated into our learning themes, like Home and Family, as seen on the photo. Learning should not be limited to the classrooms. 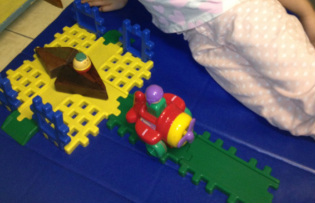 Children grasp ideas and concepts when they are engaged in activities that is enjoyable for them. What's more fun than going a for a trip to the best zoo yet in our country, Avilon Zoo. Did you know that Avilon is derived from two words, avi which means birds and lon which means land? So we literally went to the Land of Birds. 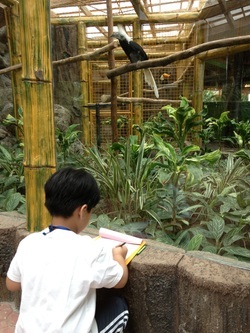 But more than an aviary, they have a wide array of exhibits. The big cats were a big hit among the children. Most of them couldn't believe there are tigers (including white tiger) and jaguars just a few feet from them. They also had a blast having their picture taken with Trixie the orangutan. The little ones even chased her around as she drove her twist car. Avilon also has bears, gibbons, meerkats, and several small mammals. We also visited the reptile house which is home to various snakes, tortoises, spiders and scorpions. The mommies were more creeped out than the children! hehe. The kids also experienced feeding guinea pigs, arapaimas (monster fish!) and even a pygmy hippo. Of course the trip isn't complete without the children documenting their experience. It has always been our practice that there are activities, prepared by the teachers, so the kids will be able to process better what they have learned, making it a truly educational adventure! 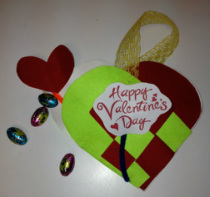 In celebration of love and life, the Childstart White Plains kids made a present for their dear mommies and daddies. Another craft that may be suitable for Valentine's Day is the Bumblebee Flower Vase, which the Kinder kids made and brought home in the beginning of our Plant Month.